Nearly half of all Americans will be diagnosed with cancer. It has become all too common. This publicaton shifts the terms of our epic battle we are losing for decades. In-depth perspective from both a professional, scientific view and a very personal one as well. Two medical professionals dedicated to helping individuals and communities heal use the arts to create the shift needed. This is a 12 week program that today is changing people lives. We'll be talking about cooking for the holidays. Leo has been featured on my show for 12 years now and always he has new recipes to share to make the season not just easier to deal with but also happier because we won't have to spend so much time in the kitchen! 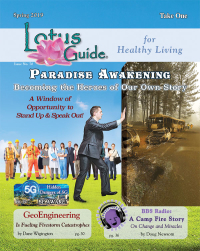 The Debut of Spiritual Emergency Training on BBS Radio!